The HPC Advisory Council Switzerland Workshop 2010 started today in Lugano. With more than 110 registered persons this is the largest conference ever dedicated to HPC technologies in Swutzerland. 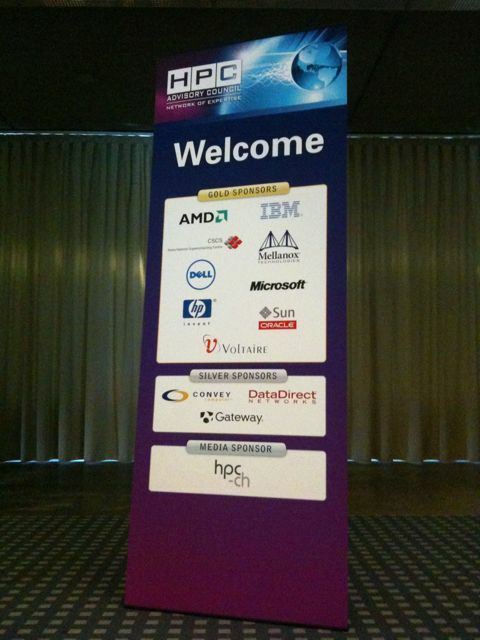 Main topic of the conference will be the use of Infiniband technologies for HPC. The following sponsors made the organization of the conference possible: AMD, CSCS, DELL, HP, IBM, Mellanox, Microsoft, Sun, Voltaire. hpc-ch is media sponsor. The workshop has been introduced by Gilad Shainer, chairman of the HPC Advisory Council. In the first talk of the Workshop, Dominik Ulmer (General Manager of CSCS) presented the Swiss National Supercomputing Centre CSCS and the High-Performance Computing and Networking (HPCN) initiative. Ulmer pointed our that Switzerland is a knowledge-based society. As a small country with little natural resources, it depends on innovation for economic success. Therefore , it has developed a strong and internationally competitive academic environment. The talk provided a short overview of the Swiss scientific landscape and hoe the national supercomputing centre CSCS enables world-class research. Neil Stringfellow (Associate Director at CSCS) presented the HPC Systems in the Swiss National Supercomputing Centre. CSCS has to support a large user community across a wide range of scientific disciplines, as well as national weather services and a number of research institutes and scientific communities. HPC systems at CSCS include a Cray XT5, which is Europe’s 4th highest placed machine on the top500 list, a large cluster to enable the physics community to analyze data from experiments at CERN, and the first Cray XT system to carry out operational weather forecasting. Hussein Harake (CSCS) presented the HPC storage Systems at CSCS. When we talk about a scalable Supercomputing system we think about a processing capacity with an interconnect and a storage attached to it. With an environment similar to CSCS where multiple HPC systems are installed, copying or moving data becomes problematic. The ultimate challenge of CSCS is implementing a global filesystem using GPFS and Infiniband. Kim Petersen (HPC Solutions Architect at IBM) presented A different approach to Infiniband as the Global Storage Network. Infiniband as an OP network carrier can provide increased bandwidth, scalability and reliability. When combined with a state-of-the-art parallel file system it can form an appealing solution for a scalable site-wide shared file system. In his presentation he exemplified the combination of Infiniband and the General Parallel File System (GPFS) to form a scalable and reliable sitewide globally shared file system. Nico Sanna (CASPUR) reportet about Experience Many-Core Architectures at CASPUR: Developing Application on Microsoft HPC 2008 Environment. Nico discussed the computing environment dedicated to the development of HPC biochemistry appliations as it has been recently released to the public under the project CASPU@XLrate. Dr. Frank Baetke (HP) presented New Developments and Trends in Scale-Out Computing. HP’s HPC product portfolio which has been based on standards at the processor, node and interconnect level lead to a successful penetration of the HPC market across all applications segments. Erez Cohen introduced to the Infiniband Architecture wotj its various components, such as Host Channel Adapters (HCAa), Switches, and Routers, as well as the various architectures accociated with Infiniband. He dived into various layered approaches, packet formats, management models, topologies, and future link-speeds as dictated by the Inifiniband Trade Association’s roadmap. Gilad Shainer (HPC Advisory Council) reported on Past Experiences on Large Scalable Applications Scalability. While HPC clusters architecture are being used for the majority of the HPC systems today, very large scale systems tend to use proprietary solutions. Now commodity based Infiniband clusters also provide a low latency and high bandwidth interconnect in addition to adaptive routing, congestion avoidance, MPI collective offloading and thus deliver scalability on par with leading proprietary networks. We also had an Infiniband Storage Tutorial by Toine Beckers (DataDirect Networks) and an Infiniband Clustering Basics Hands-on Training by Erez Cohen.